Interim head coach Alan Dickens says Saints are keen to move on from the George North saga and insists the Wales wing will give ‘100 per cent for the club for the remaining five games of the season’. North returned to training at Franklin’s Gardens on Monday, following the conclusion of his Six Nations duties. And the 25-year-old held talks with the club, accepting responsibility for missing a training session in the build-up to the March 3 defeat to Sale Sharks at the Gardens. 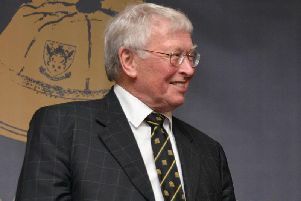 North did not feature for Saints in that game, with technical coaching consultant Alan Gaffney suggesting the player did not want to play during what was a Six Nations rest weekend. North was reported to be angered by Gaffney’s words and Wales boss Warren Gatland said he would back the player should he attempt to leave Saints before the conclusion of his contract this summer. The Lions star has already confirmed that he will be returning to a Welsh region ahead of the start of next season. But Saints have not received any offers to buy him out of the remainder of his contract. Saints released a statement on Tuesday, saying North has been ‘disciplined internally’ for missing the pre-Sale training session and is now available for selection for Saturday’s Aviva Premiership clash with Newcastle Falcons at St James’ Park. “George came in and we sat down and had a conversation,” Dickens said. “We move on. “The conversation was pretty honest and the club has made the point in the statement. “I’ve got no doubt that George is committed and will give 100 per cent for the club for the remaining five games of the season. “There is no doubt with George North that he is a fantastic player and when he’s on top of his game he is one of the best wingers in the world.